Mainframe is a Marvel character who appears in the Guardians of the Galaxy comics and helps the Guardians retrieve the SHIELD of Captain America. 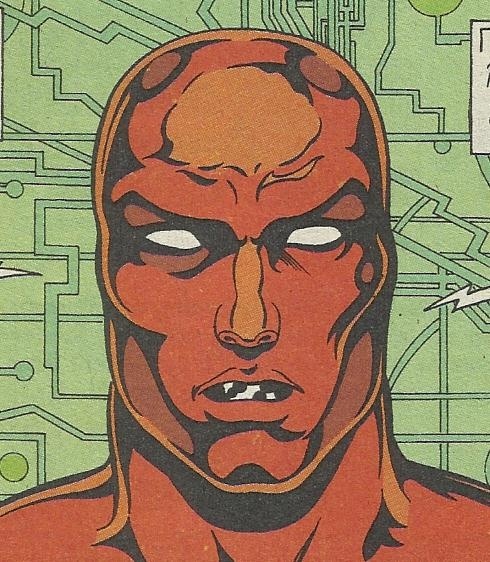 There are two different versions of Mainframe in the comics one is a futuristic Android that is based off of the Vision, the other is a computerized A.I. version of the Iron Man suit that led the ANext team. Be warned there are some spoilers for Guardians of the Galaxy Vol 2 below the MCU section. I normally post items like this here but due to spoilers I have hidden the Mainframe MCU references at the very bottom of the sheet. This version of Mainframe is encountered by the Guardians of the Galaxy. Mainframe is the evolved form of the Vision in the 31st century nearly a thousand years older than the one depicted in traditional comics. Mainframe is governing AI of the planet of Klaatu where it manages everything from the government to the weather. Mainframe also keeps a version of its Vision body on the planet of Neptune. Mainframe acted as the protector of one of the humanities most important and iconic artifacts that of Captain America's Shield. The Shield is given to the new Guardians so that they can continue its legacey of heroism in the 31st Century. Mainframe was also instrumental in the saving of Avengers Simon Williams aka Wonder Man. When the Earth was being invaded by Martians, Mainframe managed to teleport Simon Williams away. The invasion left most of the other heroes and villains of Earth dead. Mainframe's connection to Simon goes back to the neural patterns of Simon being used to construct the original Vision. This meant the two heroes often saw themselves as family. Simon ends up taking on the name of Hollywood and also becoming a hero in the 31st century. 691 - Highly advanced A.I. that controls an entire planet. Also maintains a body of the Vision that has the same super powers as the Vision. ANext - Has same powers as the Iron Man suit. Mainframe appears in the after credit scenes of Guardians of the Galaxy. In this version Mainframe is a female android and is voiced by Rockstar / Actress Miley Cyrus. There are scenes in post credits that show many characters from the 31st century Guardians of the Galaxy and Mainframe is included here. Much like Yondu who appeared in the original it does not appear that these characters are from the 31st Century but it does seem that they come from an older team that was much like Guardians of the Galaxy. The original group seem to be led by Stakar aka Starhawk (Slyvester Stallone) who had a falling out years earlier with Yondu. This was due to Yondu entering the realm of human/sentient alien trafficing that Starhawk could not stand. The rest of the members of the group that are shown in include Krugarr, Martinex, Aleta, Mainframe and Charlie-27. It seems likely that this team will appear again in Guardians of the Galaxy Vol 3.